Lately, I’ve been paying attention to a small but significant act of nature. It’s one I’ve often overlooked before. It’s the ritual dance of the honey bee. At sunrise, worker bees leave their hive and go wandering. They locate their pollen prize–a field of clover or a Chicago community garden patch. They look to the sun and record it’s precise angle. They encode this information, and carry it back for all of the bees in the hive. How wonderful! This simple dance makes me want to shout, “Hey bee! I’ve got a Hive too!” Why? Because when I see bees working together, I remember this: The knowledge of any learner must flow within its network. Among bees, the waggle dance communicates flower location. Think about it. That little dancing honey bee has all the qualities of a connected learner. It has a social system. It’s part of a sisterhood that nurtures it…and shows it how to fly. It has a system of communication. It carries a code–both in it’s genes and in it’s movements–that connects it to the world at large. It cooperates. Each bee works with others to make the sweetest of nectars. In fact, it’s whole life is like the perfect learning game, connecting food, friendship, geometry dances…and countless learning exchanges with every other bee! Not to mention that, while they’re at it, they pollinate about 90% of the world’s human nutrition. The Hive Chicago is an invaluable place to learn from the practices of other youth–worker bees, the people who provide services and learning experiences to young people in Chicago. This provides a huge benefit when attempting to create a new program. Our team at Freedom Games has been tackling a design challenge that feels as complex as a matrix of beehives. There are over 400 learning gardens in Chicago Public Schools, but though the garden beds are built, not all get planted. Without equipped teacher leaders, many school gardens are going to weed. Learning and training for CPS elementary educators needs some hive-mind magic. How can we help every teacher and kid learn the knowledge and skills to get each garden planted? That’s the challenge behind Planet Lab, a connected learning platform for youth citizen science. 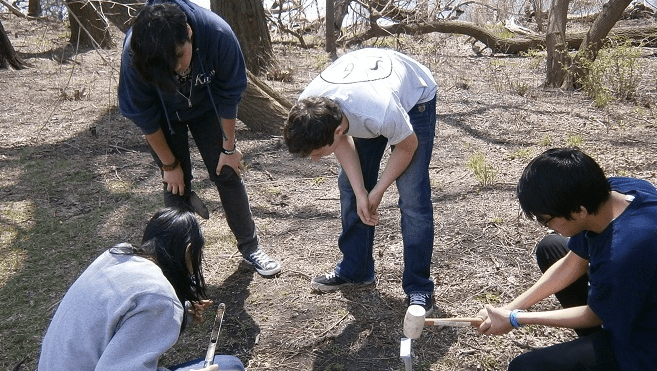 To design Planet Lab, our team collected input and action research from over 500 students and science mentors by collaborating with organizations like Greencorps Chicago, Academy for Global Citizenship, and Kitchen Community. Over and over, youth told us that they don’t want to to learn textbook science limited to their classrooms anymore. They want to connect STE(A)M learning to service, to teamwork, and to hands-on problems that extend the classroom experience — youth action research. They want their classroom learning experiences to look and feel more like the programs that Hive members design. What would it be like if all Chicago youth had the chance to solve immediately relevant, real-world problems with science and technology, instead of focusing on workbook pages? Children learning in a Kitchen Community modular garden. Here’s a real-world problem we could tackle. Of all children enrolled in out-of-school time programs in Chicago, 39% experience food insecurity. In other words, they lack consistent access to quality, affordable food. What’s worse, nearly 1 of 6 youth are regularly experiencing chronic hunger. With food stamp assistance and school meals, the one-third of Chicago children that live in poverty can scrape by. However, this years’ prolonged debates in the House led to a bi-partisan farm bill that cut nearly 9 billion dollars of food for youth suffering from poverty. When we can see the world like the bees in a hive, we understand a landscape of system-level problems. When I was a kid, my family relied on food stamps and public assistance; it’s possible that soon, many kids won’t have that option. Like many of you, my youth work career has connected me to kids struggling with the food insecurity question. In Bolivia, youth told me how the quickly rising price of water would mean choosing between food, water and medicine. At a teen homeless shelter in L.A., I met young moms caught up in the stress of gaining and losing public benefits and poverty wage jobs. On the U.S. Mexico Borderzone, I met old women begging for food for their grandchildren. They were given a shameful beggars’ meal–dried up blue corn tortilla, too tasteless to chew. 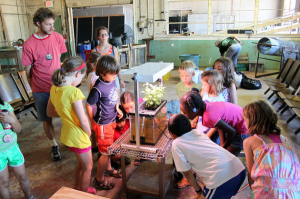 Sweet Water’s school-based aquaponics program in action. There are youth learning about aquaponics at the SweetWater Foundation, getting their hands dirty with fish poop and dirt. Thanks to you, Emanuel Pratt! There are youth thinking about how to re-engineer the food waste stream, making bricks from recycled materials at the South Side Makerfaire. Nice work, Jackie Moore! There are youth growing experimental gardens grown in the windows of After School Matters. Jameela Jafri, what a bee! There are youth digitally mapping species diversity in Chicago’s green spaces at the Peggy Noterbaert. Take flight, Dave Bild! There are youth learning how to connect Arduinos to community garden research questions at the Field Museum. Way to waggle dance, Edge Quintanilla! Dave Bild teaches youth environmental monitoring techniques and mobile GIS. 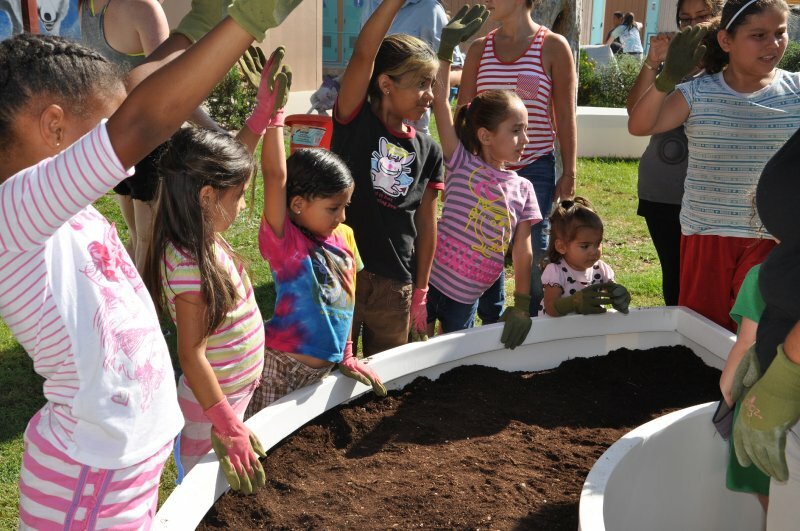 System-level problems–like growing healthy food for all kids–require hands-on design thinking, making and tinkering, and community service. But most of all, they require connectedness… connected learning can lead to the sweetest rewards. This Fall, our organization is enthralled to apply as formal members of the Hive…and we think you should too! Through this network, we’ve already gained knowledge, power and partnerships. We’ve learned through your passionate dances! When I participate in the Hive, I know that together, we are fostering that new generation who will make the world a better place. They are the savvy design thinkers who will tackle every problem until it’s solved. They are the generation who will fly high–connecting, collaborating, overcoming the designs that no longer serve us…and finding those new ideas that do. That’s astounding, and it’s something to buzz about–and tweet about, and bark, and caterwaul. Together, we can make the loudest sound. Eve Tulbert is CEO and co-founder at Freedom Games, a non-profit education design studio dedicated to working with youth and teachers to playfully re-imagine learning. This year, we’ll be launching Planet Lab beta with CPS schools and learning gardens. Be(e) in touch if you’d like to learn more!